Shalom School began as a dream in 1997...to have a Jewish pre-school of excellence in SF which instills children and young families with a love for tradition in the modern world. We partner with families in developing the minds, hearts, and souls of our young children. We have successfully attracted families that reflect the diversity of Jewish life in SF. Local Jewish families, Bi-lingual, English-Russian, and English-Hebrew speaking teachers meet the needs of this wide spectrum group. Our goal has been to serve a broad socio-economic set of families. 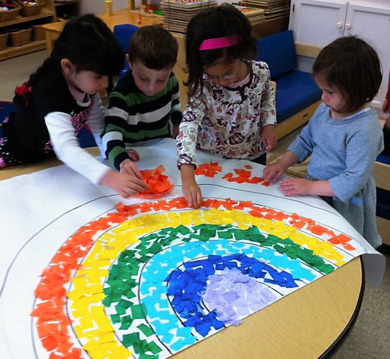 We want to give equal opportunity for young children to celebrate and learn about Judaism. Our tuition is flexible and welcoming in a way that responds to the financial needs of busy young SF families. 1998 - Bureau of Jewish Education's Best Preschool Curriculum Award—Hinda Langer and Helen Polonskaya for their multi-sensory Parsha/Midrash curriculum. 2002 - $30,000 grant from the Kohn Fund of Jewish Community Endowment—Sponsored “Parent-Baby” groups at Shalom School. Besides the weekly groups, a CD entitled “Mitzvah Magic”, was produced by Shalom School and Jen Kantor, a children's music specialist. 2003 - Through the support of philanthropist Hal Dryan, a longtime supporter of Torah education, we purchased two new buildings to make a permanent home for Shalom School at 862 28th Avenue. Our elementary school, Bais Menachem Yeshiva Day School began to grow at 834 28th Avenue. Both buildings surround the 3/4 acre Fulton playground and are 1/2 block from Golden Gate Park. 2004 - Helen Diller Award for Excellence for Jewish Preschool Teachers—Ella Kasminskaya, with the school for 10 years, won in 2004. This is the highest community honor that can be bestowed upon to a Jewish preschool teacher in the Bay Area. Ella is part of our staff in the Pre-Kindergarten class. 2005 - Gateway to Quality—Very high marks from a 30-page per classroom assessment in the areas of teacher/ student interactions resulted in Shalom School’s participation with the First Five Program. 2006 - $9,000 from Gateway to Quality—Used to refurbish three classrooms with toys, equipment, furniture, and stairway safety. 2007 - Infant Toddler Sustaining Program—By achieving the high rating from Gateway to Quality, we were invited to receive stipends of $200 per month per child from the City of SF for low-income toddlers attending Shalom School. 2007 - “Preschool for All”, a First Five Program—After successfully passing another evaluation, we were entered into this program that funds 2.5 hours per day for 4-year-olds and pays a stipend of $400 per month per child to Shalom School. For fiscal year July 2008 - June 2009, we are scheduled to receive approximately $57,000, based on enrollment. 2008 - $50,000 grant for capital expenses, Low Income Investment Fund (LIIF) of the City of SF —for 862 28th Avenue to construct a new restroom for toddlers, expand capacity in the toddler classroom and install a sink on the second floor. 2010 - One-year training program on Social-Emotional Skills in Early Childhood through PFA. 2014 - The Laszlo Tauber Fund gave $5,000 to fund an Early Childhood Consultant to coach our teachers, give sliding scale therapy, child evaluations, parenting seminars and support for parents because licensed marriage and family therapy services can be cost-prohibitive for many. This grant which gave high-level professional support was awarded through the efforts of a parent and a professional grant writer. 2015 - The Miriam and Gerald Friedkin Fund gave $10,000 towards Family Chavura Education. This helped fund family Shabbat programs, Sunday family Jewish educational programs, and helped parents develop meaningful friendships and social relationships outside of school. These interactions are so important in SF when grandparents and extended family are often in another country or another state. This supporting fund has continued through 2017- 2018. Further, we have parent coordinators enriching the family experience at Shalom School through these special events. Which Schools Did Our Students Matriculate To? At Shalom School, the warmth and rapport between teachers and children create classrooms of curious learners. They are developing critical thinking skills, socially appropriate interactions, Jewish pride and love for living a Jewish life. Developing individual children’s creativity in art and music, sport and outdoor play are all included in the healthy, well-rounded education and care each child receives at Shalom School. Our families come from all over the city for our high-quality program. We are next to the Fulton Playground and 1/2 block from Golden Gate Park, giving us many play opportunities on all the structures and amazing outdoor nature learning opportunities year round. We serve nutritious healthy homemade meals and provide snacks while observing kashrut. The children attend local trips to the fire departments, police stations, grocery stores, and museums, and gardens. We have created a nurturing learning environment that encourages innovation, invites creativity, and inspires versitile thinking. Ratio: 2 teachers and 1 aide – 18 children (3:18) With many children returning for the second year at Shalom school, they continue their natural curiosity for learning. Much of the curriculum is based on learning letters, writing, math, and science…. HOW DO YOU KNOW WHICH CLASS IS PERFECT FOR YOUR CHILD?